He is a sweet little hedgehog who loves to eat mushrooms. He loves that he was given to Spinner as a birthday gift. He doesn’t mind that he is either being chewed on or thrown around like a football. Aww, he’s very cute indeed. That is one cute toy. What a great gift! How cute! Sylvia is nutso for hedgehogs, too. I haven’t knit one for her, but she has about a dozen of them already (including Mrs. Tiggy-Winkle)! 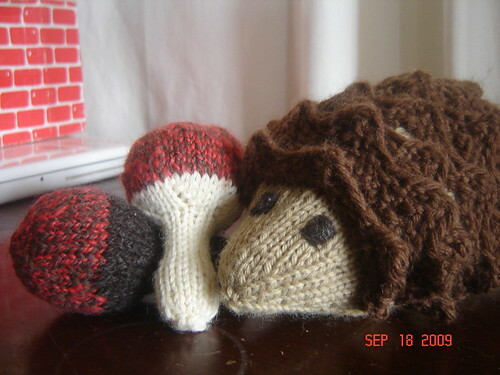 The Hedgehog is a given, but those mushrooms are really cute! And they are addicting to knit!! oh, now that is cute. What a great gift! That is so charming and creative…love this. That is one cute toy! Cute! I can see the football-like chracteristics, I’m sure that would be tossed about in my home too!